Getting my drive-on, Chevy style. It’s that ‘crap-shoot’ that is the online pick of an “intermediate” rental car. Much like a stripper jumping out of a birthday cake, Chevy Cruze proves to be a bit surprising for this unabashed Honda fan. True enough, I was raised in and behind the wheel of Detroit iron. My first project car was a 1949 Chevrolet sedan, rusted, derelict, and not running. But that didn’t stop me and my younger brother Pat from cutting our auto-loving teeth on it. I, like many Americans, fell away from the Chevrolet brand during the T.A.R.P. funded transition years of the great recession. It’s not so much that I disliked the mark, I no longer trusted its assumed life-time longevity in the auto market. Much like a long forgotten lover, Chevrolet came to mind from time to time, but I kept my distance, perhaps missing an affordable opportunity to renew my past life Chevy love fest. In-fact, the more I drove Cruze on a recent 8 hour, 375 road trip to Eureka, California, more value I found in it. Last week while my import daily driver resided in a transmission shop, I jumped online and reserved a rental car. Par for the course, Enterprise didn’t disclose the make and model of the car waiting for me at the airport. All I knew was that it would be a rather bare-bones, fuel efficient compact, and afford care-free relatively new car, unlimited mileage driving. That night I’d take delivery of a 2016 black on gray Chevrolet Cruze LT, nothing too fancy, yet eye catching just the same. Dropping into the cloth covered manual adjusted driver’s seat, I noted the relative comfort of driver to wheel positioning, instrumentation, and center stack convenience feature placement. No, this Cruze did not feature a key-less entrance or ignition fob, self dimming convenience lighting, or a warm welcoming verbal recognition from that electronic girl in the dash. But, what it did present was impressive acceleration, responsive steering wheel to road feel, and reasonable road handling. The suspension is tuned for the highway long haul – a mid-firm controlled float. I like it! I was caught by surprise as to how quiet and user friendly Chevy’s entry level compact sedan is. While one doesn’t find a plethora of active safety features in the 2016 Chevrolet Cruze LT Sedan, the stereo is decent, climate control and seating more than adequate, with combined fuel efficiency and on tap torque approaching the best in class. Sure, I’d change a detail or two. Our 2016 Cruze LT came off the lot for $21,700, a bargain in the sub-premium compact sedan segment. However, the dash mounted back-up cam resolution is sub standard, as is the cloth covered seat construction. Unfortunately Chevy found this price point at the expense of substantial, near premium trim components, and standard feature safety, as demonstrated by Honda Civic Touring and other contenders in the near premium compact sedan segment. There are few if any active safety features available at this trim level. But for those drivers wishing to up the accident avoidance level, while enjoying power adjusted, heated seats, You’ll find those options available in Cruze for under $25,000. Chevy’s 1.4 Liter turbocharged gasoline 4 cylinder engine produced impressive, on demand torque, while sipping regular gasoline. On this 800 mile run, we averaged 42 MPG combined, outstanding fuel efficiency in any segment. I found the no-nonsense 6-speed automatic to perform flawlessly in this front-wheel-drive compact, brake pressure and resulting stopping power was dead on, yet not jarring. 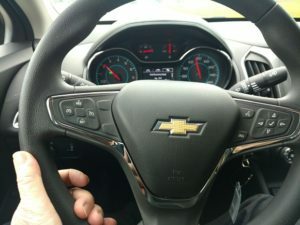 Cruze, while exhibiting mild torque steer when launched off of the light, proved to be manageable, and down right civilized when driven at lawful speeds, under mixed weather conditions. Cruze LT is a good value as priced. I recommend a test drive to anyone considering the purchase of an economy compact 4 door sedan. Chevy Cruze presents fun, economical driving basics, housed in a class act of a compact sedan. It’s a no ensconce daily commuter, that can be dressed up and taken out on the town. I like that.